Agent Jason Belz, GDL, Mitchell with Reynella Grazing Co, Reynella, Charleville Droughtmaster cross steers. The steers sold to 322c/kg, reaching a top of $887 to average $830. Cattle were mainly drawn from the local supply area, with some good quality local lines yarded. A good panel of buyers was present and operating. The yarding was dominated by steers and the overall quality was again mixed, with demand remaining strong for the better cattle. Heavier yearling steers were present in larger numbers and the number of cows yarded also increased. Medium weight yearling steers to domestic feed eased 4c and medium weight yearling steers to export feed decreased by 2c/kg. Heavy weight yearling steers to feed saw no change. Medium weight yearling heifers weighing 200-280kg, going to restockers or background, eased 26c, while medium weight yearling heifers to domestic feed decreased by 1c/kg. Medium weight 2 score cows eased 20c and the medium weight 3 score cows eased 19c/kg. A good sample of medium weight yearling steers to domestic feed sold to 310.2c to average 304c, while a large sample of medium weight yearling steers to export feed made to 315.2c to average 306c/kg. A good sample of heavy weight yearling steers to feed made to 314.2c to average 307c/kg. A large sample of medium weight yearling heifers weighing 200-280kg, going to restockers or background, made to 255c to average 233c/kg. A good sample of medium weight yearling heifers to domestic feed sold to 278.2c to average 262c/kg. The best of the medium weight grown steers sold to 300.2c to average 291c/kg. A fair sample of grown heifers under 540kg sold to 256.2c to average 247c/kg. A good sample of medium weight 2 score cows sold to 215.2c to average 199c, while a fair sample of medium weight 3 score cows sold to 240c to average 220c/kg. A large sample of light weight bulls to restockers sold to 294.2c to average 255c/kg. Sam Bartlett, Elders Quilpie with Scott Cattle Co, Thylungra Station, Quilpie Santa steers. The steers sold to 308c/kg, reaching a top of $1,082 to average $711. Weaner steers under 220kg topped at 304c/kg and averaged 271c/kg, weaner steers in the 220-280kg range reached 322c/kg and averaged 291c/kg. Steers in the 280- 350kg range reached 315c/kg and averaged 297c/kg, and steers in the 350-400kg range reached 315c/kg and averaged 302c/kg. Feeder steers in the 400-550kg range topping at 314c/kg and averaging 294c/kg. Cows and calves hit $1,500/unit. Reynella Grazing Co, Reynella, Charleville sold Droughtmaster cross steers to 322c/kg, reaching a top of $887 to average $830. Palmtree Grazing, Palmtree, Taroom sold Santa steers to 315c/kg, reaching a top of $1,398 to average $1,076. The Santa heifers sold to 278c/kg, reaching a top of $908 to average $825. LJ & MT Ridge, Mascotte, Wallumbilla sold Angus cross steers to 315c/kg, reaching a top of $1,180 to average $986. Moonbong Partnership, Ravensbourne, Blackall sold Simmental steers to 314c/kg, reaching a top of $1,448 to average $1,012. John Ellis, Myland, Wallumbilla sold Charolais steers to 314c/kg, reaching a top of $1,335 to average $1,335. BR Sinnamon, Tin Hut, Jackson sold Angus steers to 314c/kg, reaching a top of $835 to average $835. Cargara Cattle Co, Cargara, Augathella sold Braford steers to 314c/kg, reaching a top of $811 to average $811. JL, RM, MD & FE Bidgood, Katoomba, Injune sold Charbray cross steers to 312c/kg, reaching a top of $813 to average $755. CA Flower & Co, Garrabarra, Roma sold Santa cross steers to 310c/kg, reaching a top of $1,818 to average $1,141. Wondolin P/Co, Wondolin, Wallumbilla sold Santa cross steers to 310c/kg, reaching a top of $1,222 to average $1,041. 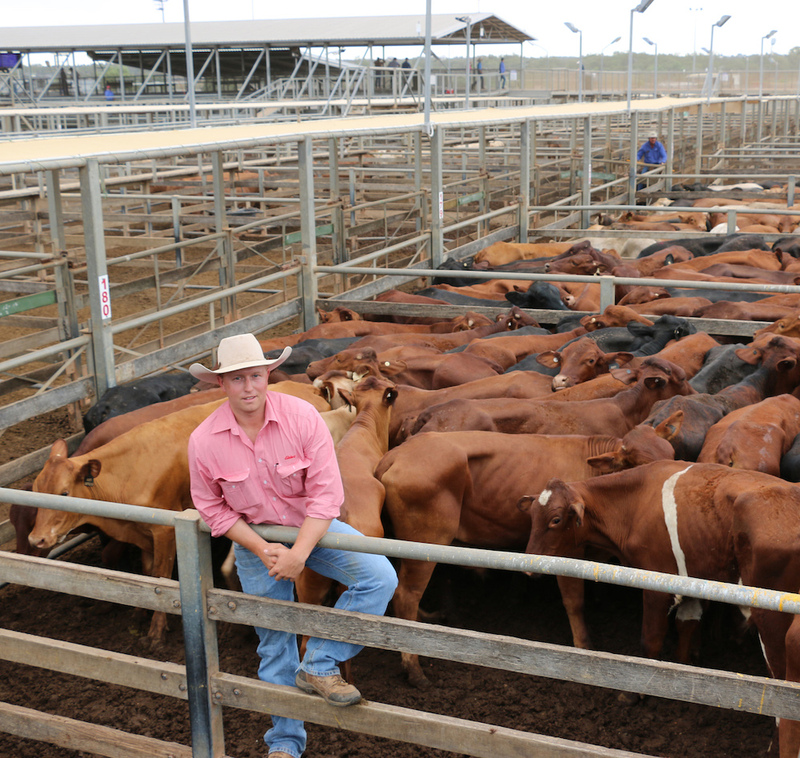 The Santa cross heifers sold to 252c/kg, reaching a top of $1,020 to average $738. CR & P Cleland, Angry Jungle, Wallumbilla sold Santa cross steers to 308c/kg, reaching a top of $1,853 to average $1,267. S & R White, Mt Saltbush, Roma sold Angus cross steers to 308c/kg, reaching a top of $1,165 to average $838. The Angus cross heifers sold to 268c/kg, reaching a top of $855 to average $731. RJ Green, Mayfield, Taroom sold Santa cross steers to 308c/kg, reaching a top of $1,086 to average $944. 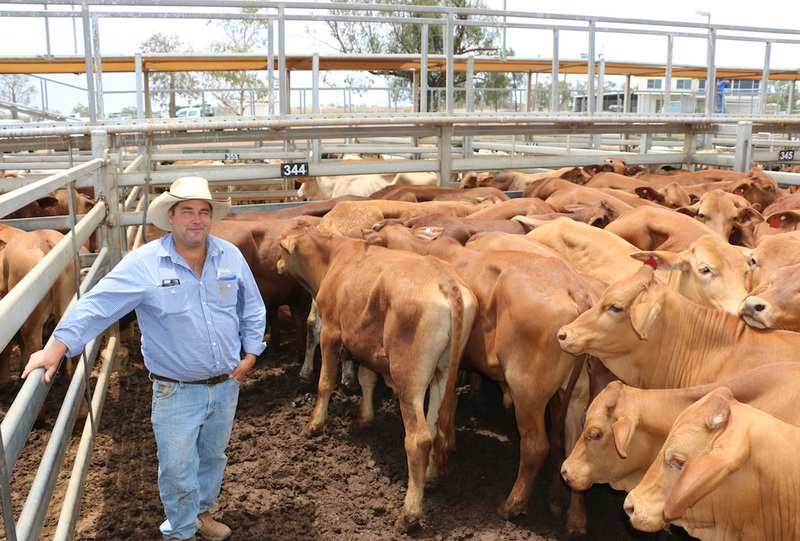 Scott Cattle Co, Thylungra Station, Quilpie sold Santa steers to 308c/kg, reaching a top of $1,082 to average $711. Terry Jukes, Armadilla, Morven sold Santa cross steers to 304c/kg, reaching a top of $762 to average $762. T & L Sypher, Araby, Roma sold Charbray cross steers to 304c/kg, reaching a top of $624 to average $624. SJ Ward & SK Fink, Karana, Injune sold Brahman steers to 300c/kg, reaching a top of $1,326 to average $1,268. Kevin Bredhauer, Mitchell sold Charolais cross steers to 298c/kg, reaching a top of $778 to average $644. BB & PD Mason, Teeswater, Mitchell sold Charolais steers to 296c/kg, reaching a top of $1,906 to average $1,793. Farmleigh Pastoral Co, Nullawurt, Roma sold Angus steers to 280c/kg, reaching a top of $1,622 to average $1,622. Heifers under 220kg topped at 248c/kg and averaged 198c/kg, while heifers in the 220 – 280kg range topped at 278c/kg and averaged 229c/kg. Heifers in the 280- 350kg range topped at 288c/kg, averaging 254c/kg. Heifers in the 350-450kg range topped at 288c/kg, averaging 240c/kg. Hurford Trust, Belgaum, St George sold Simbrah cross heifers to 288c/kg, reaching a top of $1,037 to average $934. Hornick Grazing, Mt View, Injune sold Charbray cross heifers to 258c/kg, reaching a top of $966 to average $840. Cows in the 300-400kg range reached 220c/kg and averaged 170c/kg, while cows in the 400kg-500kg range reached 262c/kg and averaged 197c/kg. Cows over 500kg topped at 262c/kg, averaging 219c/kg.